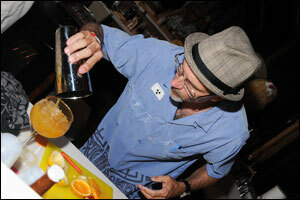 Hundreds of revelers at the ninth annual Hukilau, the most intimate Tiki gathering in the world, were treated to the ultimate trip into the world of tropical drinks, exotic cocktails and otherworldly decor in Fort Lauderdale, Fla., on Thursday, June 10. The Polynesian Pop festival's opening night party gave participants unprecedented hands-on access to the burgeoning world of retro cocktails and interior design. Movers and (cocktail) shakers in the Tiki revivalist movement joined forces on an odyssey to sample libations, enjoy live music and meet friends old and new over the course of the evening's events. "2010: A Cocktail Odyssey - The Hukilau Room Crawl" took the festivities to another dimension in bacchanalia. 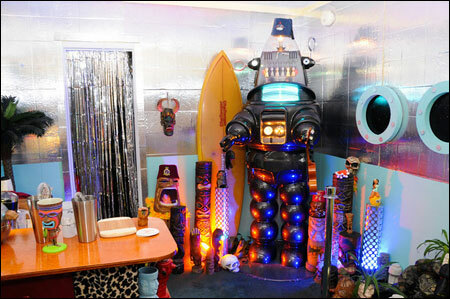 This year's theme, inspired by the classic Kubrick film and its sequel, gave room hosts an opportunity to show off their mixology skills along with their interior design abilities by decking out their rooms in their individual interpretations of Atomic/Tiki/Space Age decor. Room parties took place throughout the evening with hosts vying for the "Best Room Decor" prize and using sponsor rums and ingredients to compete for "Best Cocktail Creation" honors. The evening culminated with the "Master Mixologist Cocktail Challenge," a Food Network-inspired contest featuring secret ingredients, renowned judges and high-octane fanfare as entrants competed for the evening's grand prize. Participants raced the clock to create a unique signature tropical drink using sponsor rums and pre-determined exotic ingredients to determine who has what it takes to be crowned the first "Hukilau Master Mixologist." What's a "room crawl"? For the uninitiated, it's simply a very festive, organized series of Tiki-themed room parties hosted by Hukilau participants during scheduled times during the event. It gives hosts an opportunity to show off their mixology skills and imagination in decorating their rooms in their favorite Tiki-inspired decor. All Room Crawl hosts received several donated bottles of the sponsors' products to create their signature cocktails and The Hukilau donated limes, lemons and mint to ensure fresh ingredients for the cocktails. 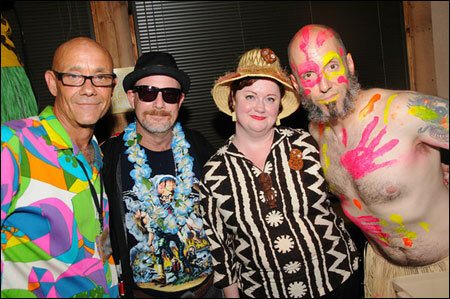 Planet of Forbidden Tiki, "Best Decorated Room"
Rooms were judged by Hukilau Room Crawl organizers Jim "Hurricane" Hayward and Mike "Jetsetter" Jones plus vendor coordinator Basement Kahuna. Cocktails were judged on taste, originality, creativity and presentation. Decor was judged on originality, creativity, theming and hospitality. Both winners received a $100 gift certificate from legendary Tiki palace, The Mai-Kai in Fort Lauderdale. Special thanks to the Go11 Team, who provided all the great photos on this page and somehow found time to host the Cocktail Challenge after-party in their "Spaceport" penthouse. And, of course, a huge mahalo to Hukilau organizer Christie "Tiki Kiliki" White for making it all happen. The build: In a mixing glass pinch one inch of fresh banana and muddle with the juice of one lime. Add the rest of the ingredients (save the 151) and shake well with ice. Strain into a double old-fashioned glass packed with crushed ice. Top with the 151 and garnish with the fresh lime zest. 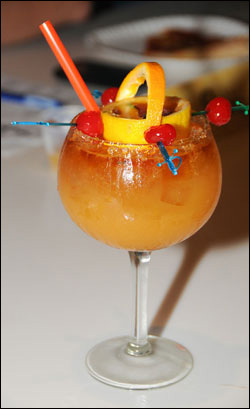 Five competitors, four mystery ingredients, just 20 minutes to make a taste-tempting Tiki drink that will impress our expert judges and earn one winner the title Master Mixologist of Hukilau 2010. This was the challenge thrust upon the contestants in the first annual Master Mixologist Cocktail Challenge. 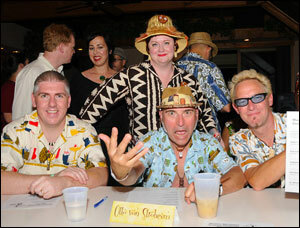 The contest was the highlight of the opening-night party at Hukilau 2010 in Fort Lauderdale on Thursday, June 10. Hundreds gathered at midnight in and around the beachside "Skylounge" penthouse to see this first-of-a-kind competition inspired by such Food Network contest shows as Iron Chef and Chopped. 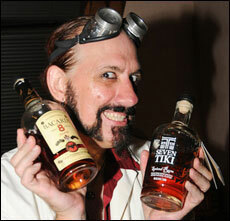 Joe Desmond, a master mixologist in his own right and proprietor of the world-famous Rhum Rhum Room in New York City. Otto Von Stroheim, longtime Tiki cocktail expert and founder/organizer of California's Tiki Oasis event. And last but not least, Josh Agle, aka "Shag," a California-based painter whose distinctive works have been featured in solo exhibitions around the world and who is considered a pioneer in spurring the resurgence of interest in Tiki culture. The cocktail creations were judged on creativity, originality, taste, balance and presentation. The judges were also on the lookout for the most inventive use of the mystery items, all of which had to be present in the final product. To win the challenge, contestants were required to present a finished drink plus samples to each of the judges when the clock ran out. The contestants also had at their disposal a fully stocked kitchen of shared ingredients, including a variety of fruit, juices, syrups, liquors and, of course, rum. All the ingredients featured in the contest were pulled from the many recipes featured in the books of Jeff "Beachbum" Berry - some common, some obscure. The penthouse's centrally located, sunken kitchen was transformed into a mixology "arena" as spectators gathered on all sides to watch the thrilling competition. 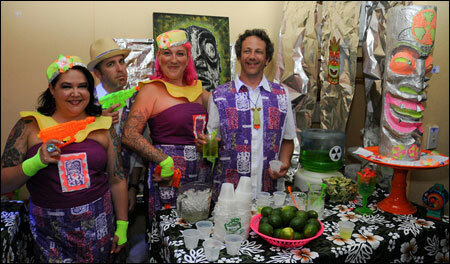 The five competitors assembled at their workstations with all the tools they needed to create a memorable exotic drink. The contestants bravely raced the clock and ignored the surrounding chaos. Hukilau organizers and Tiki celebrities were right on top of them in the crowded kitchen as King Kukulele hovered on the counter above offering his distinctive running commentary and zany comments. Grady Johnson mixes "Hell in a Handbasket"
Adding to the revelry and confusion, King had pizzas delivered during the middle of the contest and passed out slices to the judges. But the mixologists were unfazed. All five did an amazing job of completing the drinks and samples before time ran out and they were all received warmly, albeit with some criticism, by the expert panel. They all presented professional, fully garnished cocktails in one of the specialty glasses available to them. The judges rated the drinks on a scale of 1 (lowest) to 5 (highest). Here are the official results, including contestant name, drink name and score. We're glad Grady made it to the mainland for The Hukilau, as he brought an uncommon flair to the contest. His complex, flaming concoction, "Hell in a Handbasket," easily edged out the competition to earn him a spot in Hukilau mixology history. 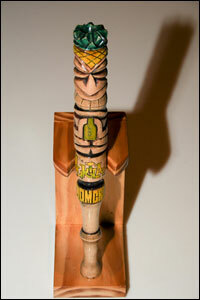 In addition to the glory of being crowned the first Hukilau "Master Mixologist," Grady was awarded several grand prizes: A custom-sculpted, hand-carved muddler by renowned Tiki carver Tom Fowner; and a gift certificate to the Mai-Kai to use during the Hukilau festivities. The winning recipe will also be featured in the program for Hukilau 2011, the 10th anniversary of the Hukilau. Shake with ice and serve in a cocktail glass. Garnish with a cinnamon stick gently wrapped with a long orange twist. The winning drink, "Hell in a Handbasket"
 Fresh orange: Cut in half widthwise. Cut circular slice from center. Cut circle in half, removing flesh from half-circle. Use peel as a handle for lemon basket. Secure with toothpicks and garnish with cherries.